Now I will be the first to tell you that I am not perfect! The makeup and facial products that I use are not all chemical free and probably never will be, but I am going to start moving in that direction and I am starting with these! Lets talk a little bit about the benefits of cucumber- they contain antioxidants which will help with visible signs of aging! Sign me up! I don't need to hear anymore... jk! The alpha hydroxy acids in cucumbers help make skin brighter and firm, smooth, and tone your skin. They also help destroy free radicals on the skin. Also, they help with inflammation which will help rid the bags under your eyes! I mean the list goes on! On to the rose water- it helps maintain oils and balance your skins PH level. It helps hydrate your skin and aids in healing scars, cuts, and wounds (acne!). Rose water helps regenerate your skin cells! And as a bonus the scent of the rose water is a mood booster! Its safe to say that this combo is a total power couple in the skincare world! Obviously Beyoncé is the rose water and Jay-Z is the cucumber! Ok, thats a little weird, but you get it! Cut the cotton pads into half moon shapes. You will need quite a few! Blend the cucumber and rose water in a blender until liquified. Then put the mixture into a bowl. 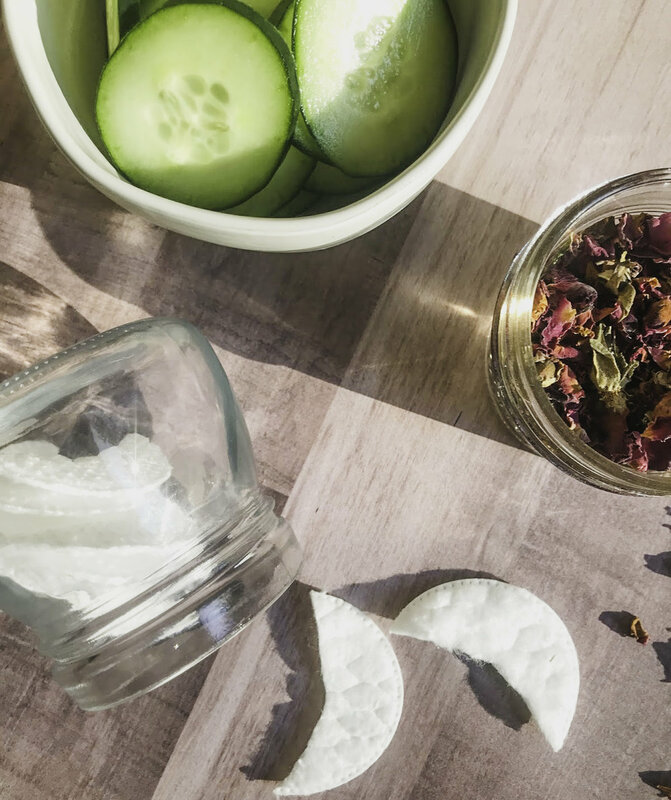 Let the cotton pads soak in the bowl with the cucumber rose water mixture. Squeeze them out and then soak again. This helps the product really get in there! Store them in a glass container in your freezer. Let them thaw for about 5-10 min prior to use! Apply the soaked pads under your eyes and let them sit for about 15 minutes! proclaimed house cat who loves spending her weekends at home being cozy. Nothing soothes her soul more than listening to Mariah Carey while baking cookies and snuggling with her actual fat orange cat!